Digital Camera’s May 2019 issue comes with a one-year subscription to ACDSee Photo Studio Ultimate 2018, but we’re hearing that some readers have experienced difficulty registering their copies. If you have been affected, then just drop us a line at digitalcamera@futurenet.com with 'ACDSee Photo Studio' in the subject line and we’ll send you a licence key via return email. ACDSee Photo Studio Ultimate 2018 is a powerful digital asset manager and raw image editor with layers. It works on 64-bit Windows only, and our promotion gives you a licence that lasts one year from the date of activation. Your computer system will need to be running Windows 7, 8, 8.1 or 10 with the following hardware requirements: Intel Pentium 4 or AMD Athlon 64 processor (2 GHz or faster), 2GB RAM (6GB recommended) and 2GB of available hard disk space. ACDSee Studio is a powerful photo editor that gives you full control over your images. You can organise, share, enhance and edit with the five versatile and accessible modes inside the software. The download provided with this issue is the Ultimate 2018 edition, which gives you access to the full range of ACDSee Photo Studio tools. ACDSee Photo Studio is available to buy as an outright purchase or via an affordable annual subscription that entitles you to any updates during your subscription period. Five different modes let you work on your photos in different ways. Manage Mode, for example, is where you can organise and share your image collection, with tools to help you categorise and tag photos so you can easily find them later. Think of Edit Mode as the ‘Photoshop’ space inside ACDSee Studio: this is where you can get creative with filters and layers. There’s a whole set of Adjustment Layers that enable you to apply effects non-destructively, plus Layer Masks to control where the effect is applied. Develop Mode offers a different way to edit your photos – one that’s more analogous to Lightroom. ACDSee Photo Studio is able to import raw files from hundreds of different camera models; here’s where you can work with that rough data, manipulating exposure, colour, sharpening and more to craft the perfect image. As well as essential exposure settings, Develop Mode lets you transform your photos with a variety of effects. Apply a Photo Effect preset, add a colour overlay, introduce a post-crop vignette, and more. Edit Mode has a comprehensive selection of filters you can apply to your photos. They’re grouped by theme to enable you to find a filter quickly based on what you want to achieve. Add elements such as text to your image; adjust its size and shape; work with light; edit the colours; and play with detail. ACDSee Studio is designed to make sophisticated editing as simple and accessible as possible. For example, the Color EQ filter uses simple colour-based sliders to enable you to adjust the hues in your scene. 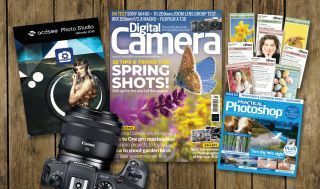 For full details of how to download the software, see page 70 of Digital Camera magazine's Spring issue.